Dang. This is another of those weeks where I can barely find the time to keep my eyes open, let alone write a review. And I was doing so good! I promise next week will be better. But for now, I need opinions. At my library job I am allowed to listen to audio-books while working. I work for 5 hours every day. Mix those two things together, and you have me listening to A LOT of audio-books. Seriously. A TON. My poor library can't keep up with me, so I've started using ILL (inter-library loan). The POINT is that I'd like to review these audio-books. It wouldn't be like a normal book review, because I'd be reviewing the quality of the recording & narrator, rather than the quality of the story. I only ever listen to audio-books of books I have read before, though, so you'd be able to find a "book"-review if you wanted to. What do y'all think? Would you mind seeing audio-book reviews on Squeaky? "The POINT is that I'd like to review these audio-books." It's your blog, girl! Do what you want! p.s. I'm always looking for audiobook recs. Heh. Good point. I'm going to review them no matter what, but I'm curious to see if anyone would care. I don't care if you don't care. Just curious. I love audiobooks and I listen to a lot of them. I would really like to read audiobook reviews because I've definitely found that some productions are MUCH better than others (I'm a fan of Full Cast Audio's productions of many of Shannon Hale's books, I'd guess that you've listen to those!). I'm curious, why do you only listen to audiobooks of books you've already read? I totally get that it's a different experience than reading a book and some stories I just have to read, but I've found that audiobooks are a great way for me to read books that I otherwise wouldn't have time for but still had some interest in. I'd love to know your reasons because when it comes to our reading/listening habits, we all have our own preferences! And what a great perk! I would love to be able to listen to books while I work. Enjoy it! Because I read while I'm working I sometimes tune out the audio-book. Sometimes for just a few seconds, sometimes for a few minutes, without even noticing. If I try to listen to a new book I'll miss things, but if I've read the book before then my mind will fill in the blank. I used to listen to audiobooks without reading the book, but that was back when I would just sit in my room and listen without doing anything else. I would love to see your reviews of audio books! I listen to a lot of audio books as well and have noticed that some narrators are definitely bettr than others. Sounds good to me! I know the narrator can make or break an audio book in my experience, so I'd like to know beforehand if he/she is terrible. Or wonderful. I have a few favorite readers that I just love to listen to. I adore Jim Dale, who does the "Harry Potter" series. Also, Stephen Briggs narrates all of Terry Pratchett's work and he is phenomenal. Audiobooks are expensive, but I'd love to know which audiobooks are worth listening to. I've started listening to audiobooks this year, and I really would love to see recommendations. A good narrator is hard to find, it seems... I would be ecstatic to see these reviews! I've become a fan of audiobooks so I would love to read reviews. I review audiobooks all the time! Sometimes it's the first time I've read it, and sometimes it's not, but people seem to like them. I think I may have even converted a few people! Plus, June is audiobook month!! Perfect timing! Do it! I hate when I get an audio book and the narrator isn't exactly as good as I expected. If you do this it will help me know what are good books to listen to on tape and what ones aren't. 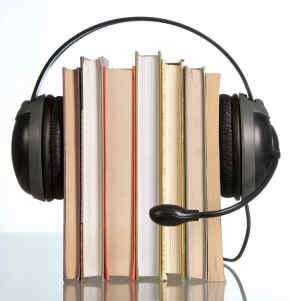 Love hearing about good audiobooks. Always looking for new ones to check out. Bring on the reviews! Do it. Listening to an audio book can be an entirely different experience than reading the novel. I love listening to audiobooks and am always looking for new ones. I would love to see you review audiobooks!